PumpPod™ is our latest innovation. It is an intelligent, integrated water pressure boosting system. It is a prefabricated solution intended to replace the traditional booster pumping stations and site designs. It is a plug and play solution that requires minimal works to install that offers real cost and carbon savings to customers. The PumpPod™ is designed for clean water pumping only. It can be used for domestic, commercial and industrial applications and is used to boost water pressure or control flow in the main supply to properties and premises. It can be easily integrated with existing water infrastructure. The PumpPod™ can also be used in temporary or over-pumping applications. The PumpPod™ could be used during emergency or planned shutdowns of existing assets as a quick and flexible mobile solution to ensure continuance of water supply/pressure. Designed with reduced capital budgets in mind; PumpPod™ arrives on site assembled and ready to install. 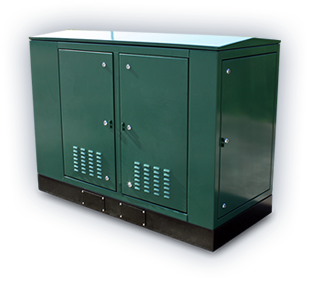 The PumpPod™ range is of standard design therefore you do not incur design costs each time. Its intelligent control systems alternate the use of pumps to prolong economic life span and reduce maintenance cost. The PumpPod™ significantly reduces civil and building requirements as the solution arrives fully assembled in the kiosk. PumpPod™ can avoid planning permission restrictions due to its small footprint. It also has aesthetic benefits over conventional installations as it is less visually intrusive. PumpPod™ is designed for safe one person working. 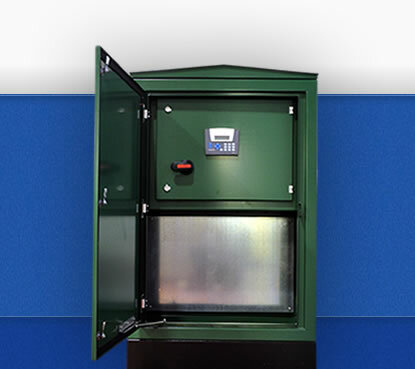 Gas struts are installed in the lid and door stays on the cabinet to minimise the risk of injury. Isolation valves and emergency stops are integral. Our PumpPod™ is an energy efficient pumping solution. The various pumping regimes and variable speed pumps are designed to run with minimal power usage in mind. The assist function ensures that additional pumps are only used as required. The reduction in associated civil and building works for each installation contributes to the PumpPod’s™ lower carbon foot print.